The image below is of the Arran ferry Isle of Arran loading at Ardrossan. It costs about £7 per person for a day return, about £30 per return per car. There is a large inexpensive car park at the terminal where you can park your car. If you are traveling by car at weekends or on school holidays, best to pre-book, as the ferry is often fully booked then. Ardrossan Train Station is situated about half of a mile south of the ferry terminal. You can buy train/ferry tickets at a discount. Train/Ferry Map. The image below is from the ferry arriving at Brodick, about 50 minutes crossing time. The bus station is situated next to the ferry terminal. Buses run north to Cladach, Corrie, Sannox, Lochranza, and round to Blackwaterfoot about 10:55 . 13:40 . 16:20 . 19:05. Check times Tel - 0141 332 6811. These buses normally depart about 5 minutes after the large ferry has docked. There does not seem to be any buses for the first ferry. The large brown building across from the terminal is the Douglas Hotel with a popular beer garden, ideal when waiting on the ferry back. The image below is of from a car park and bus stop at the north side of Sannox village, about 8 miles north of Brodick. The path on the left side of the cottage leads to Glen Sannox, that leads down to The Saddler at the foot of the 2,621ft Cir Mhor mountain. This is the shortest way to Cir Mhor. I have not hiked to the top of Cir Mhor yet, but have good images of the routes to the top, as seen below. Cir Mhor is in the middle of the mountains, so not the easiest to get to. It is often referred to as the Materhorn of Arran. Best to try and hike this mountain in clear weather. The image below shows the Goat Fell range to the left, and Casteal Abhail range to the right. Cir Mhor is down the valley between the two ranges. The image below is from the north side of the 2,867ft Goat Fell mountain, looking west to Cir Mhor. The Glen Sannox trail leads down to The Saddle, with the north side of The Saddle being real steep hiking up to just under 1,500ft. A sections on the north side of The Saddle is named The Chimney. It is then about 1,100ft from the top of The Saddle to the top of Cir Mhor, again real steep hiking. You can also hike up Glen Rosa from Brodick up to The Saddle, then Cir Mhor. The saddle is not quite as steep from the Glen Rosa side. You can also hike over from Goat Fell which is a long hike. The steadiest way to Hike Cir Mhor is probably from the north, on the Casteal Abhail route, as seen in the next section. The image below is of the the route over to Cir Mhor from the 2,818ft Casteal Abhail mountain. This is probably the least steep route to Cir Mhor, although the final section from this side is steep as well. Saw some teenagers return from Cir Mhor wearing shorts, some with messed up knees, must have been partaking in some tough scrambling. The northeast route up Casteal Abhail to this spot is fairly straight forward, a steady incline. 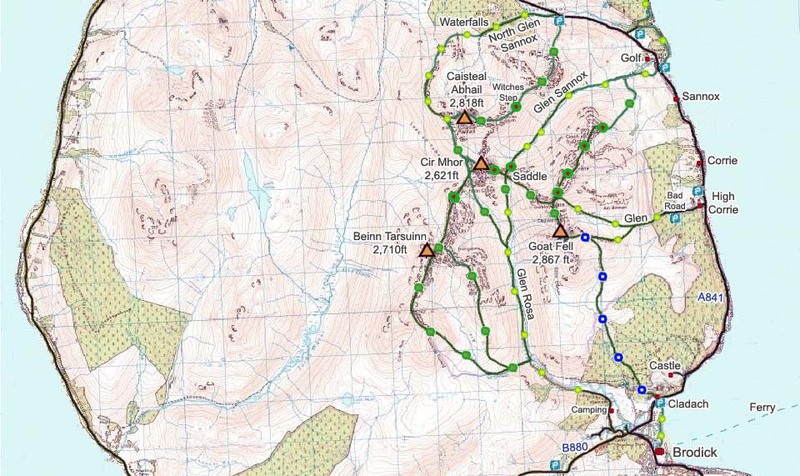 The Cir Mhor Map below shows the main routes onto the mountain. The Green and Yellow dots show the fairly safe northwest ridge route. The Green and Brown, and Green and Red dots, show the more dangerous routes. The Witches Step is normally regarded as the most dangerous section of all the mountain trails on the Island of Arran. The hike to Cir Mhor will be fairly dangerous from any route, so should only be tackled by seasoned hikers, preferably in clear weather.